This step is used to put your wireless card into Monitor mode. In Monitor mode, your card can listen to every packets that's around us. By default, the mode of wireless devices is set to "Managed" that means our wireless device will only capture packets that have our device's MAC address as the destination MAC. It will only capture packets that are actually directly to my Kali machine. But we want to capture all the packets that are within our range even if the destination MAC is not our MAC or even without knowing the password of the target device. To do this, we need to set the mode as Monitor mode. 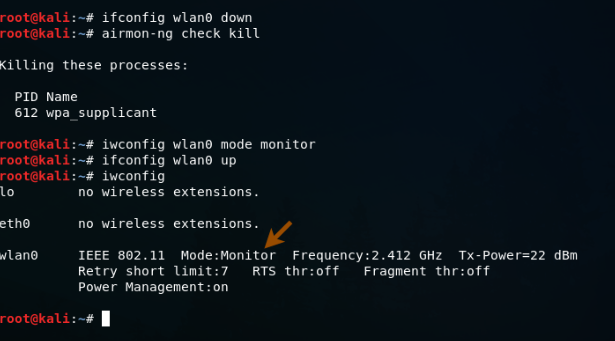 We can use iwconfig to see the wireless interfaces. 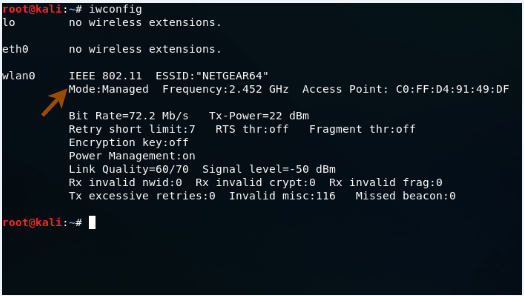 In the above image, you can see that the wireless interface wlan0 is in Managed mode. Use the following command to set it in Monitor mode. airmon-ng check kill command is used to kill any process that could interfere with using my interface in monitor mode. After this command, your internet connection will be lost. In the above figure, you can see that the mode is changed as Monitor mode. Now we are able to capture all the Wi-Fi packets that are within our range even if the packets are not directed to our computer or even without knowing the password of the target network. To do this, we need a program that can capture the packets for us. The program we are going to use is airodump-ng.